Well, the fleet here just got bigger by one. I bough her home yesterday, but the story starts last week. 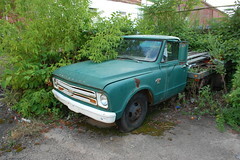 I saw an ad for this 1964 Chevy C10 on Craigslist. 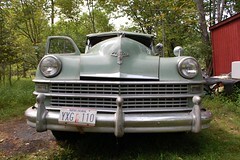 It listed it as running & driving well and all original. However it was 2.5 hours away, and there was no way to cram a 5+ hour round trip into my schedule that week. So I sent the guy an email saying I was interested in looking at it the next week, and tried to put it out of my mind, figuring if it was as advertised it would be gone by the time I could see it. I loaded up the newly upgraded Wee Trailer(more on that in another post) and went away to PiCon(a scifi con) for the weekend. I returned home late on Sunday, and monday morning gave him a call only to discover the truck was still available. This caused me to leave work on monday, pick up the ever patient girlfriend, and drive to New Hampshire. Upon arrival I was greeted by the most basic truck I have ever encountered. 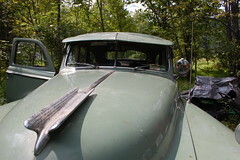 Inline six, three speed on the column, no radio, no power steering, no A/C, no power brakes, no passenger mirror, no passenger sunvisor, no center mirror, no passenger key lock. This thing is the platonic ideal of truck. Only the things you need in a truck, and nothing more. However when he turned the key the engine instantly sprang to life, and ran well. And the transmission shifted well once I figured out the quirks of the column-shifted three speed. And everything on it worked like it was supposed to. And inspection of the body revealed rust on several locations, but nothing terminal or structural, meaning it could be repaired at my own pace. The only big issue was the ancient bias-ply tires. After a test drive and some negotiations I put down a deposit and headed back home, planning to return Thursday to pay it off and take it home. Thursday after work found me once again trucking up to New Hampshire, and once arriving I paid him, got a bill of sale and the key in return and headed home. Once I stopped trying to shift quickly and got into the rhythm of the column shift(and thereby stopped getting the linkage jammed up) the drive was pretty uneventful. 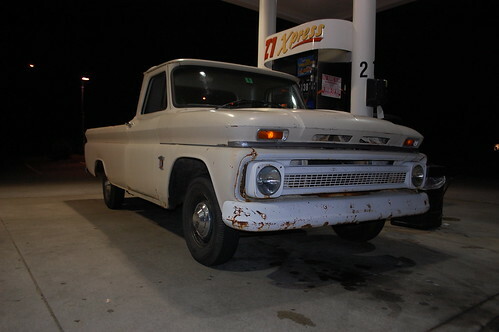 The truck ran well, and I drove home, though I did curse the terrible tires much of the way as they inspired zero confidence what so ever between the shaking, squealing on turns & tracking of every minor groove in the road. The only minor issue that came up was when playing with the high beam switch(on the floor) I managed to make the low beams stop working, so I drove home on the high beams which no one seemed to notice as I didn’t get anyone flashing their lights at me. 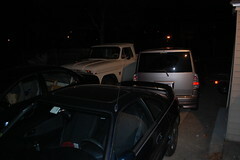 Once we returned home I re-arranged the cars and was able to get most of the truck into the driveway(though the last foot or so spent the night on the sidewalk). This morning I drove it to work without the slightest problem or issue. I’ll have another post in the next few days with more pics and a more detailed breakdown of it, but for now I’m just glad to have a classic vehicle that I can actually use and enjoy. 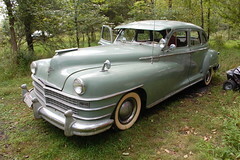 This 1948 Chrysler New Yorker was listed on Craigslist asking for the best offer over $2000. 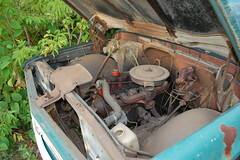 According to the ad the engine was rebuilt 5000 miles ago, and ran and drove well with no rust. I’ve been looking for a replacement for the wagon since I’ve gotten frustrated that I can’t drive and enjoy it. So the girlfriend and I piled into Box and headed out on the 3.5 hour drive to New Paltz NY. 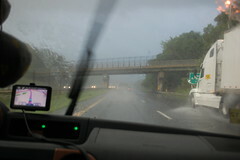 Along the way the weather varied randomly between beautiful blue skies and absolutely biblical rainstorms. Eventually we made it out to his house, which turned out to be over a small mountain and down a dirt road. There sitting in the driveway was eighteen feet of Chrysler’s finest. However it was a long time since this car had been at its best. It was a bit tired and worn everywhere, but honestly looked fairly respectable for a 64 year old car. We met the owner, who was an older gentleman who informed us he’d bough the car 26 years earlier as a project, but gotten distracted by a boat and hardly done anything to it. Turns out that the car’s registration had expired a decade earlier, and hadn’t been touched in that time. 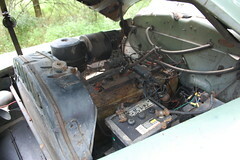 He’d decided to sell it and so had the carb rebuilt, added an electric fuel pump and put a new battery in it. According to him it ran great and have driven well the tiny bit he’d driven it up and down the driveway. Well it did start on the first crank, and settled down into a smooth idle, just as promised. However less than a minute later it sputtered to a stop. He poked and prodded and declared that it was probably out of gas. After he stood there for a bit I asked if he had more, to which he seemed a bit surprised and said he’d have to go get some. After he just stood there some more I asked if he could do that. Looking a bit surprised by my request he got a gas can out of the tiny garage, climbed into his van and headed off to wherever the nearest gas station was. This at least gave us a chance to look over the car very thoroughly. 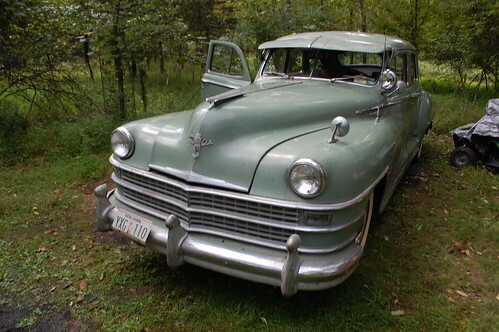 The body was fairly rust free, though not without its share of dings & scrapes. 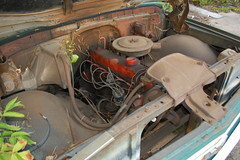 There was some rust underneath, but not much given the age and all in fairly easy to fix areas. The interior was by and large nice, however mice had gotten into the headliner and both eaten holes in it, and left behind nest that gave the inside a certain miasma. All in all I declared that if, once he returned with gas, it ran/drove/stopped I was very interested in buying it. The girlfriend was pretty much on board with this idea, and we discussed various ways of getting it home and whether we could do it that day or would need to make a second trip to retrieve it. 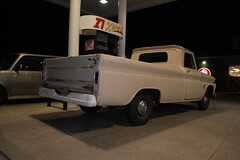 Well the seller returned and poured five gallons of gas in the tank ,we once again fired it up. This time it ran for a moment then sputtered to a stop the moment I gave it gas. Thus followed an hour and a half of various fiddling, blowing out of filters, checking of hoses, priming of carb and checking of the float. Eventually it was discovered that when he changed the fuel line he’d managed to put the needle in the carb backwards so when it tried to draw fuel it instead blocked the flow. With this fixed it was now running like a champ, and it was now time for a test drive. I decided not to bring my camera, which turned out to be an error. But I was so enthused to try driving this monster to think clearly. However the seller climbed into the driver’s seat, so I grudgingly piled into the passenger side. At the end of his driveway he hit the gas, and was met with a lot of revving from the engine, and not much forward motion. He commented that it had never done that before, and how odd it was because he’d just refilled the Fluid Drive(a torque converter on the transmission). I asked him what he’d filled it with, and he replied “Dexron of course”, which from my limited research beforehand was exactly the wrong fluid to use. Despite the badly slipping transmission he plowed on ahead, at the first intersection he commented on how the brakes felt odd, even though (as was being a common refrain) it had never done that before. I made a comment about turning back, but he continued on regardless. About a mile down the road smoke was visibly leaking in through the dash vents, when I commented he seemed to act like he didn’t hear me. As we started up the road over the mountain the car bucked a bit, and he commented on how maybe we should turn around. I strongly agreed and once he pulled over to a driveway I hopped out to help stop traffic while he turned the huge car around, by this time the brakes had gone out completely, and he was stopping the car with the emergency brake. He nearly drove off without me until i slapped the side of the car as he came by. He stopped long enough for me to jump in the back seat with my girlfriend before trundling back down the road. The car began sputtering more, and stalled out completely just after a blind corner. Here we were, in a car that wouldn’t stay running, with a transmission that slipped badly when it did run, and without any brakes to stop it with. Thankfully our salvation came in the form of three guys piled into a Ford pickup. They pulled up along side and asked if we needed a hand, and when we shouted that we did they immediately pulled over. A quick conference was had and they headed off with the seller to his place to get his tow rope. So now we were sitting on the side of the road with someone else’s dead car, and one of the guys from the truck. This time my girlfriend and I mostly talked about how to get the heck out of here as soon as possible, and joked about what had happened thus far. Finally our saviors returned, and we hooked the Chrysler to the back of the truck. 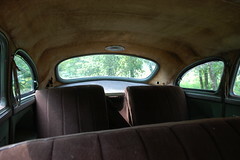 As the truck was full with it’s occupants we found ourselves once again riding in the Chrysler. What thus followed was about the scariest drive I’ve had under 25 miles per hour. Our erstwhile drive wasn’t correcting for the angle of the tow rope so while the truck was in its lane this massive car was half in the oncoming lane, and he alternated between riding the parking brake and letting us drift close to the truck every time they slowed. Finally they got us as far as the end of his dirt road, and said they couldn’t pull us any further. They unhooked the car and headed off. I suggested we push the car down the hill so it could coast most of the way to his driveway. The seller said he thought it was a bad idea. I then said we should at least push it out of the middle of the road. He agreed and climbed in the driver’s seat. Shrugging, we gave it a push and once it started rolling he yelled that he was going to coast as far as he could. Once he’d coasted as far as he could(and we’d walked back to the car) we used his minivan to get it in the driveway, made some hasty goodbyes, and got the hell out of there. Despite being a complete washout as far as something I might want to buy, the trip at least made for one hell of a story. I did feel a bit sorry for the seller as he was elderly and seemed to be getting confused, also he didn’t seem to quite grasp that the a car that had been sitting for a decade would not be the same car when it left the garage as when it went in. Now open, the newest Improbable Garage location! The first actual car work has happened in my new garage last week. 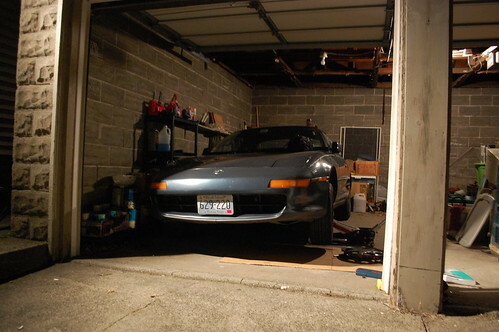 It was just a tie rod & plugs on the my girlfriend’s MR2, but it was real car work, in a garage that is mine. The garage is still a mess, and the other bay is full of furniture & bins, but it is a start, and more is coming. I have actually done some more since, but I am so busy the blog posts will keep being a bit delayed & erratic. I Will freely admit that I have a weakness for pickup trucks. I also have a weakness for dual rear wheel flatbed trucks. 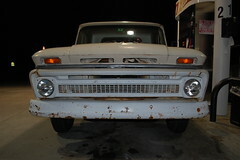 And, thanks to my late father, I have a weakness for ’67-’72 Chevy trucks. Combine these with a habit of surfing craigslist & ebay for cheap old vehicles and it is a recipe for unexpected roadtrips to look at old junk. A few weeks ago I ran into this particular truck, advertised for the princely sum of $700. 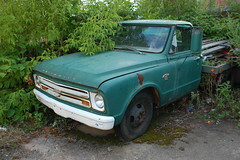 It is a 1967 Chevy C30 flatbed with an inline six and 4-speed manual. According to the ad it needed a new radiator, but would run and drive once that had been installed. A brief conversation with the seller ensued where he informed me it had been his buddy’s daily-driver for years until he got something else, then was driven occasionally until the radiator was stolen a few years ago. Rationalizing to myself that a truck would be handy with the new house, I and my ever-patient girlfriend headed out on a 4-hour round trip to see it. I called the seller when we were an hour out as he had requested, and got no answer. Multiple follow up calls as we got closer met with similar lack of response. 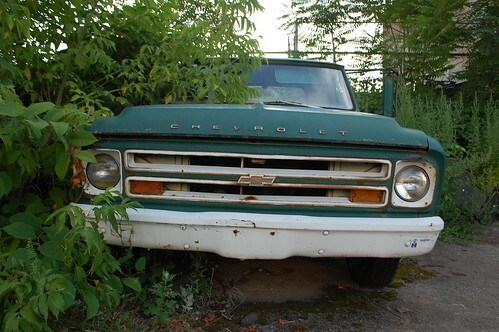 We eventually found the truck anyway, parked down a steep asphalt ramp in the basement hole where a building had been and half covered with local flora. Sitting before me was a truck that had clearly not moved in a long, long time. 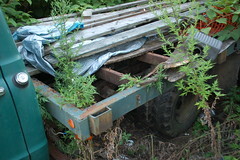 The flatbed wood was rotted away(something he had warned me of, and a cheap fix). But it was clear after even a cursory inspection that it was going to need far more than a radiator to be ready to hit the road. The muffler was hanging half off, the windshield was cracked, one vent window was a precariously dangling piece of broken glass hanging by rusted metal. 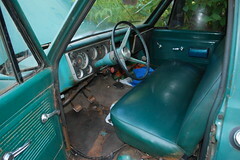 However the green interior was in really good condition, without a tear in the vinyl seat. 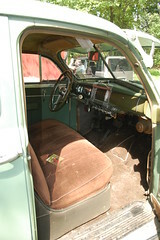 And the cab seemed free of the rocker & floor rot these trucks are infamous for. So I was willing to at least give it a chance. 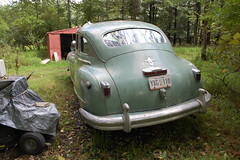 I had dragged a collection of car-reviving items with me, battery, jumper cables, tools, gas can, carb cleaner/engine start. So out came the battery and over to the truck to pop it in and give it a shot. No. Battery. Cables. Whoever had stolen the radiator for the copper scrap had gotten the copper battery cables too. Now I was looking at a truck that would need $20-$50 of parts to see if it cranked over, let alone started. Then a $150-$300 for rad& hoses to see if it ran & drove. Since at this point we were still in frantic house renovation mode to prepare for our upcoming move, the last thing I had time or money for was a truck where I didn’t know if it was a good runner or a paperweight. So with much regret I called the guy to say I wasn’t interested(he didn’t answer), and headed for home. I was glad I’d walked away before getting sucked into another massive project, but at the same time I was sad to let it go because if I’d found it at a different time it would have made an excellent project truck due to the lack of rot & the good interior. Ah well, maybe next time. 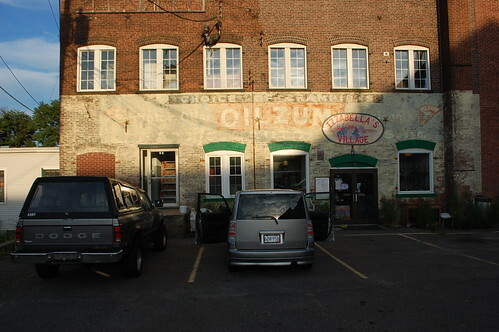 I did find a really neat ghost sign in the parking lot next door, so it wasn’t all a waste.